The broken vase handle required months for acomplete restoration. An aerial photo of the Buttram estate. The mansion’s rooms were filled withpaintings, tapestries and collectibles. The year was 1923. The date was Aug. 16, and Oklahoman Frank Buttram sent a Western Union telegram from the Powell oilfield in east Texas nearby Corsicana to his wife, Merle Newby Buttram and it read, “Drilled in this afternoon, made seven hundred barrels first hour FEEL RELIEVED”. On September 15, 1923, The Dallas Morning News stated, “Frank Buttram, oil operator of Oklahoma City, is endeavoring to drill a well each day for 15 days in Powell, Texas field”. “Buttram and Associates have settled oil production of 30,000 barrels daily”. This series of events were such a rewarding success story, it would change the lives of Frank and Merle Buttram forever. During the mid 1920’s the Buttrams decided they would travel the world, and on several of their trips to Europe, they bought furniture and art pieces for a new home they wanted to build in far northwest Oklahoma City. In 1926, Frank and Merle Buttram purchased an 86-acre site at 7316 Nichols Road and hired a San Antonio architectural firm Ayers and Ayres to design and build a 20,285 square foot Italianate mansion with 30 formal and informal rooms. The Buttram mansion is believed to have been the first air conditioned private residence in Oklahoma. Also, the Buttram mansion was known for its professional landscaping, botanical gardens, and Oklahoma’s City’s first residence with a swimming pool and dressing room. The Buttram mansion was completed by the late 1930’s. Frank and Merle Buttram became two of Oklahoma City’s leading philanthropists during the later years of their lives. Frank Buttram died in 1966 and his wife, Merle in 1971. They had a large family, and Dorsey Buttram was one of five children and the person asked to work and manage the family energy companies and handle family estate matters. In 1975, and after Merle’s death, the Buttram mansion was sold and all the furnishings and art pieces were distributed to the children. Randy and Preston Buttram are the grandsons of Frank and Merle Buttram and sons of Dorsey and Phyllis Buttram. After the death of Dorsey and Phyllis Buttram, the sons became the keepers of the family records and owners of their parent’s estate. Now is when the story really becomes intriguing. Randy and Preston made the decision to contact their longtime friend Jody Kerr regarding the guidance for conducting an estate sale and auction of the family property in storage. After reviewing the family property, Jody Kerr recommended Scott Shuford from the Dallas Auction Gallery. 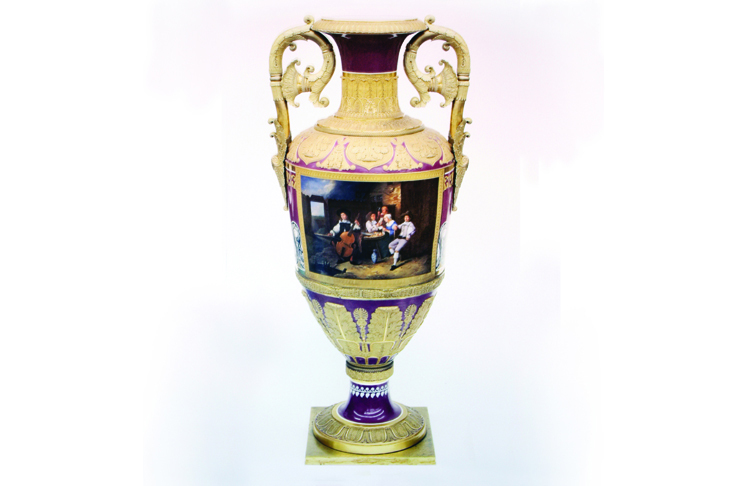 After Shuford made a visit to Oklahoma City to review the family property, he became interested in two 4-foot porcelain vases with oil paintings of the Dutch master painters on the exterior of the vases. These vases were purchased by Frank and Merle during one of their trips to Europe for their home they were planning to build in the late 1920’s. With more research, Shuford learned these vases were made in the 1800’s at the Imperial Porcelain Factory then owned by the Russian Czar Nicholas I. The czar’s wife was passionate about “porcelain art” and enjoyed creating in that time period what they called “Russian Imperial Palace Vases” as gifts for visiting dignitaries and Russian royal family members. Shuford then contacted the Hermitage Museum in St Petersburg, Russia and spoke with Ektatarina Khmelnitskaya, the museum chief porcelain curator about these vases. Ektatarina flew from St. Petersburg to Dallas and previewed the vases. Ektatarina was charged with the authentication of the vases and later verified that the Hermitage Museum records show that one of the original Dutch master paintings from the Hermitage Museum was sent in 1832 to the Imperial Porcelain Factory to be reproduced on one of the vases. The records for the painting on the other vase could not be found nor artist identified. The discovery of these vases is a real event, says Ektatarina. Ektatarina made the recommendation to ship the broken handles from the vases to a restoration expert in New Jersey for a complete restoration which took several months. A Mr. Yuri Hanin from the Art Group in Cliffside Park New Jersey was selected to completely restore the handles to the vases for an estimated price of $18,000. In April 2013, the vases were publicized for auction by the Dallas Auction Gallery. Immediately, eight interested bidders came forward for the vases and one of the bidders sent their art dealer representative to Dallas from London for inspection of the vases. With this much bidder interest in advance of the auction, Shuford recommended to Randy and Preston that he conduct a private sale before the auction date. During late April 2013. Randy and Preston Buttram accepted a $2.7 million dollar offer for the Russian Imperial Palace Vases, originally created in the 1800’s, purchased in the 1920’s and kept in storage boxes for years, from one of the eight buyers in a private confidential sale. In 1990, the Buttram mansion was named to the Register of Historic Homes. Today the current owners of the Buttram Mansion are Jerry and Carleen Burger.